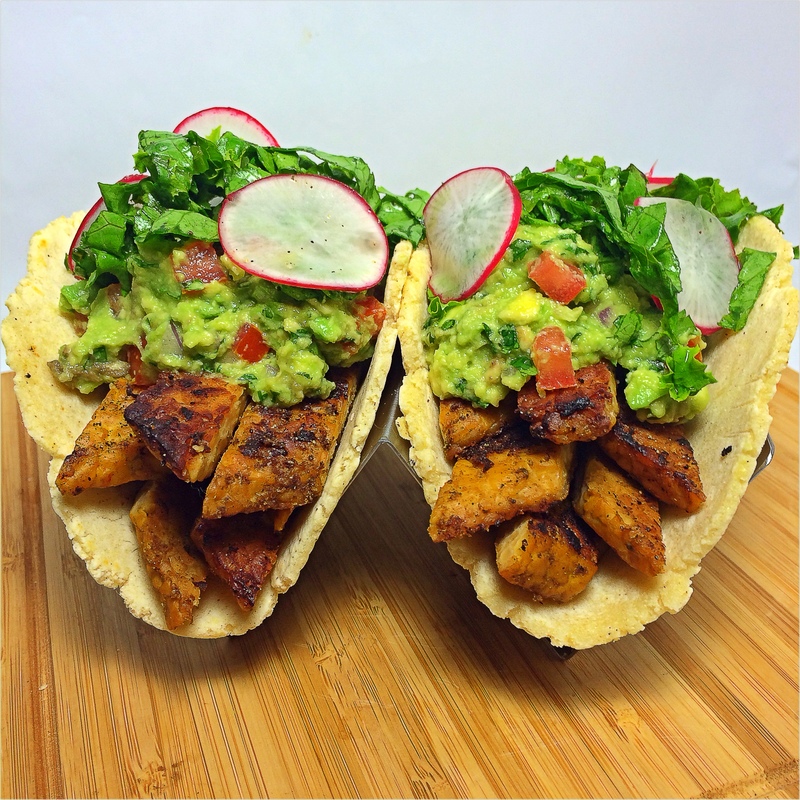 We here at Vegicano love tacos – and by we – I mean me. There’s just something about ’em that sets ’em apart from any other dish in any other cuisine. Perhaps its the layers of flavor or the ability to mix textures; or maybe its because they are the perfect ‘hand’ food – It’s like an edible envelope of yummy goodness. Wow. I’m starting to sound like Rachel Ray. This taco is simple, delicious and adheres to my idea of a good taco: No more than 3 (filling) ingredients. Now, that’s not me being some sort of taco snob mind you – that’s just personal preference. I don’t like too many flavors competing against each other – can’t we all just get along? If there was a fourth addition it would more than likely be something that I’d add after the fact, like, a salsa or hot sauce. But that’s preferential, it’s a matter of individual taste and doesn’t dictate the flavor profile, it merely enhances it. But. Seriously. No Taco snobbery here yo! 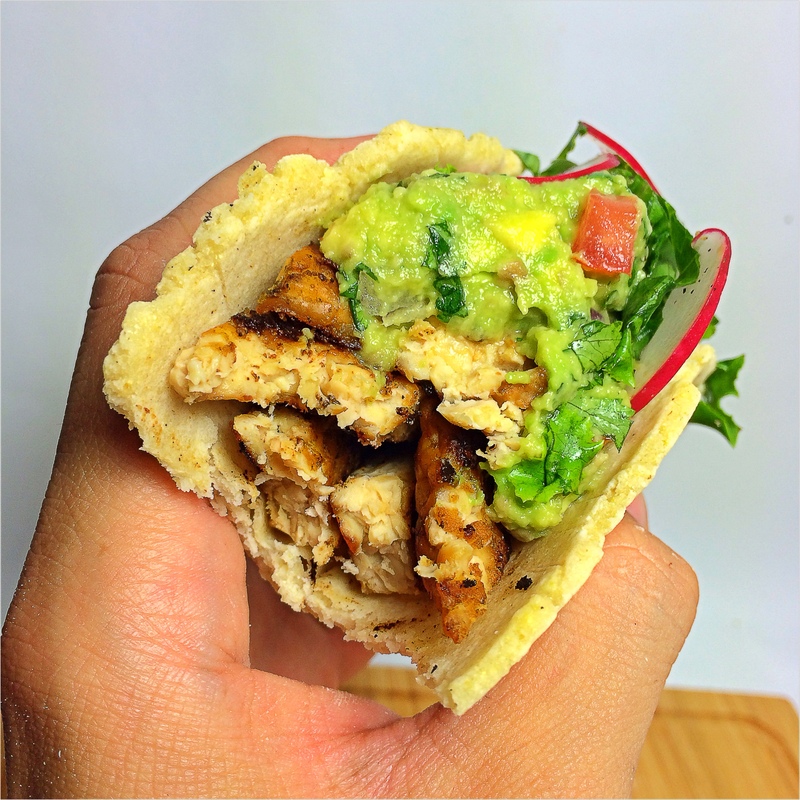 This taco is simple, delicious and plays off a tempeh marinade I use often. I blanch the tempeh as I’ve shown before, marinade it, then sear it on both sides in a little canola oil and finish it off by deglazing the pan with the leftover marinade and a bit of water. Cut evenly down the middle of the block of tempeh; its basically going to go from a long rectangle to two squares. From there, using a sharp knife (and y’know being mad careful) slice down through the middle – to create two flat pieces. You should end up with 8 thin(ner) squares. 6. While your tempeh is nearing the end of cooking – when you’ve achieved a nice color & char – pour remaining marinade and 2 TBS of water – lower heat to medium and cook until all the liquid has been absorbed. 7. Slice your Tempeh in diagonal “strips” – or however you’d like really.